This sale is for the License Plate Bracket only, Light Bar is not included. The new license plate mount when attached to a Low Profile Prime LED light bar offers you an extreme combination of rugged and durable that is tough enough for all conditions. With the ability to last you over 2,000 days of use, thermal management to help guarantee you every last hour, with the option of an easy to use dimming switch, all of that with an extremely low ampere draw. LED light bar�s are also backed with an IP rating of 68, that means that it is totally protected from dust and can be fully submerged in water, this light will do anything you need it to. 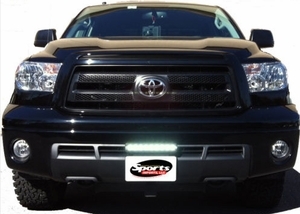 LED light bars also sport a rugged aluminum housing along with a shatter proof PVC lens. All of these features and an easy to install kit will have you wondering what Vision X can do you for you next.